When California Gov. Jerry Brown recently signed "AB 1747":https://leginfo.legislature.ca.gov/faces/billNavClient.xhtml?bill_id=201520160AB1747, a bill to expand support for programs tackling hunger among college students, a dedicated group at Humboldt State University knew they had played an important part. Authored by Assemblymember Shirley N. Weber (D-San Diego), the measure takes several steps toward fighting student hunger, like providing funding to support partnerships between college food pantries and local food banks. The bill also supports CalFresh outreach programs and requires colleges to annually inform students of food assistance programs. Students organize HSU’s Food Pantry located in the Student Recreation and Wellness Center. Major portions were inspired by programs and research at HSU, which were helped along by donations from alumni and other supporters. Leading up to the bill’s signing, HSU Social Work Professor Jennifer Maguire and Health Education Coordinator Mira Friedman had testified in front of state lawmakers about the many efforts at HSU. Speaking in front of at the Select Committee on Campus Climate, which Assemblywomen Weber chairs, Maguire and Friedman outlined the development of Oh SNAP!, HSU’S program to alleviate hunger. They shared how HSU became one of the first universities to accept EBT cards so that students can use CalFresh benefits on campus, and they also talked about the University’s food pantry program. “This law is a great move for California. Colleges will see more support from the state to address hunger among students and that can go a long way to ensuring student success. But we’re also just beginning to address this issue. Much work still needs to be done,” says Maguire. In her testimony, Maguire also suggested several ways the state could expand its efforts to address hunger among students, which is classified by the USDA as being “food insecure.” The USDA administers food assistance programs at the federal level and provides funding for CalFresh, the state’s implementation of the federal Supplemental Nutritional Assistance Program. Maguire recommended that the state Dept. of Health & Human Services work closely with Financial Aid offices to identify students who would be eligible for CalFresh and that college enrollment meet the employment requirement to receive assistance. According to her official press release, Weber was inspired to write the bill by both an intern struggling with hunger and listening to student testimony at the Hunger, Homelessness, & Homework hearing last November. Weber also cited two system-wide studies conducted by the California State University and the University of California. 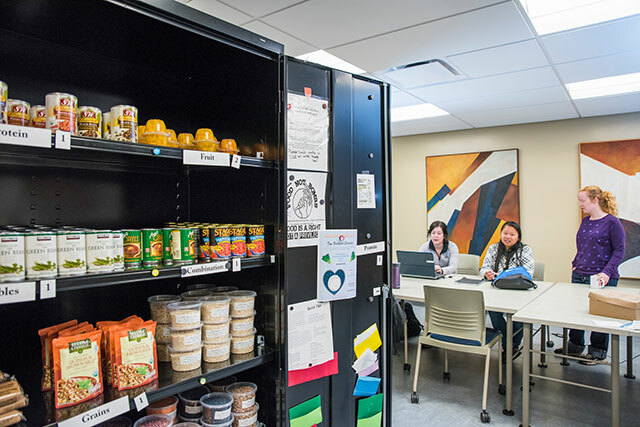 In the CSU study, faculty, staff, and administrators were interviewed and estimated that 24 percent of CSU students experience food insecurity and 10 percent are homeless. The UC study surveyed students and revealed that 42 percent report being food insecure. Currently, the CSU Office of the Chancellor is engaged in the implementation of an extensive research study on student homelessness, displacement and food insecurity as part of a broader aim to develop systematic solutions that enable more students to succeed and graduate. HSU students just received an invitation to participate in the CSU system-wide study, which is open now through Monday, Oct. 24. Students can find an invitation to participate in their email inboxes now. Recommendations from the study findings will be used to create data-driven campus support services and mobilize public policy to increase the ways college students get their basic needs met. For now, it is a huge success that AB 1747 has been signed. The law could make it easier to complete their studies. In 2012, Center for Law and Social Policy issued a report highlighting ways that access to benefits like CalFresh has a demonstrable positive effect on graduation rates among non-traditional students. The bill is set to take effect Jan. 1, 2017.